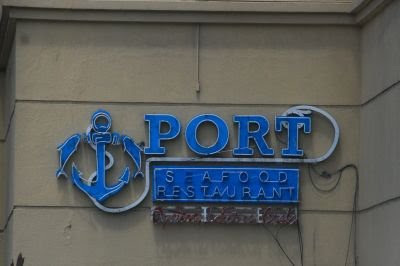 Just outside Waterfront Cebu City Hotel and Casino (Waterfront Lahug) and the first thing you see when entering the hote's premises, is a so called seafood restaurant The Port. Tutubi ate there with his officemates on their first night and boy, it's another frustrating experience. His friends made reservations at 8pm to eat there well aware that the place is really popular place for hotel guests and casino gamers, but when they arrived at 8pm, there were many other people queued waiting for their turn to find a vacant seat. Seems the place is really popular due to the P299 eat-all-you can with Chinese guests (probably Taiwanese) standing guard at the door even if it there's slight drizzle. 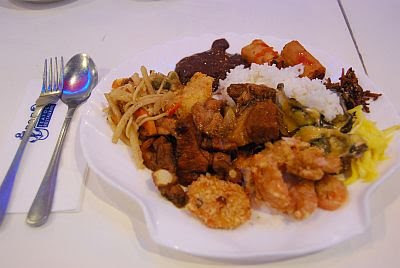 It took about 30 minutes of waiting time for Tutubi's group to be finally seated and the buffet is not what's really advertised- there are only a few seafood choices on the menu-- contrary to the name seafood restaurant. The menu includes lechon (roast pig suckling), dinuguan (pork blood stew), pancit (pinoy style noodle), dilis (anchovies), lumpia (spring rolls) amongst other usual choices but the taste of the dishes were rather bland and ordinary and can be shamed my most jollijeeps in Makati. Tutubi's first plate inside the ambiance that feels like you're inside a ship. Rating: deserves no second chance. There are better places to eat in Lahug unless you're trapped in the middle of a typhoon. They should consider removing the seafood word in their name for it's misleading. If you can, visit Sutukil in Mactan near the Lapu-lapu monument. Yeah, I've been to this "resto". Sounds like it hasn't improved. Much better is the resto by the sea at Shangrila Mactan. Loved the mango (I think everything is with mango when mango season is on!) desserts! what a shame to offer a seafood restaurant and yet no seafood or rather very few of them on the buffet. oh well you are right no point in coming back! there are many many more food spots in cebu compared to a few years ago. even me who comes home from time to time, is amazed at the many restos sprouting all over. But nothing beats home cooked meals whenever I'm back. it's a pity that some establishment do that. false advertising. have you been to su-tu-kil restos in cebu? the meals there are definitely tastier. Oh, I have tried sutukil before in Mactan! Huge servings! tutubi, ey you came by cebu! that ain't such a popular place for the locals and for P299 in a 4-star hotel, one should not expect lots of seafood. looks like a rip off. Some restaurants are like that. Due to their great location and attendance, they tend to slack up on their offering. Where the hell is the beef? Mmm, looks like a pretty nice plate.